Students regularly visit TRACC to collect data for a graduate or masters degree project. Art or science – if you are passionate about ocean issues then we have intern positions for a wide range of backgrounds. Marine conservation is often about communication and artists, photographers and media students can all become extraordinary advocates for ocean issues. Each year, we support a few students to become useful interns to do some great science or art. We have a range of projects in 2016, from fish surveys to reef restoration, coral planting techniques, Stabilising rubble, optimising growth of coral species, impact of El Nino, climate change impacts on reefs, Sharks, rays, anemone fish reproduction, biodiversity. Other projects are possible such as the art installation #biggestsharkinborneo. What are your interests? Art, media or communication interns please contact us with a formal presentation of ideas. Can it be done in 12 -16 weeks. Does it have a hypothesis? Does it follow scientific method? What is the control variable? How discrete is the experimental variable? Random or structured experimental design? Has the student really thought about this? Most student projects start with a 4 week volunteering experience to gain experience and dive qualifications. When you have a month of doing underwater work under supervision from our staff then you will move to doing your own things safely with minimal supervision. 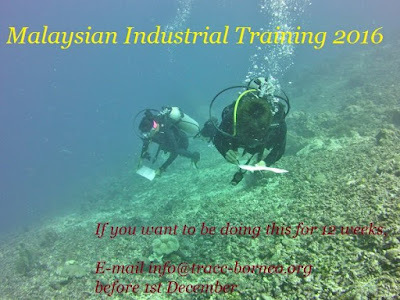 We like people doing independent projects to be Rescue diver qualified. We expect a scientifically viable proposal, background research, strong commitment to the project, regular written reports, Photos and video, several presentations to others at the camp and a copy of the final report as submitted to your university. We don’t consider a research project a holiday, it may be fun but there is significant work involved if it is going to be worthwhile. A scientific internship requires investment by TRACC in your future, There is a lot of competition. Are you worth our effort? To stand out from the crowd: Don’t simply send us a CV. Send us a one page (max) project draft based on what you care about, what you can see is happening in the world of marine science or conservation, in our blog or on our facebook & twitter pages.